The coastal range of northwestern Baja California has a year-round Mediterranean climate, with plenty of sunshine and warm dry summers. The Guadalupe River Valley near Seagate’s factory in Ensenada has become a small but growing center of grape-growing and wine production. Seagate has been processing Grape Seed Extract since 1996, receiving grapes from select nearby fields. Seagate uses a species of grape called Vitis vinifera which can produce a range of colors depending upon the degree of ripening. The higher the sugar level in the grapes provides for better fermentation that yields a higher conversion into alcohol. 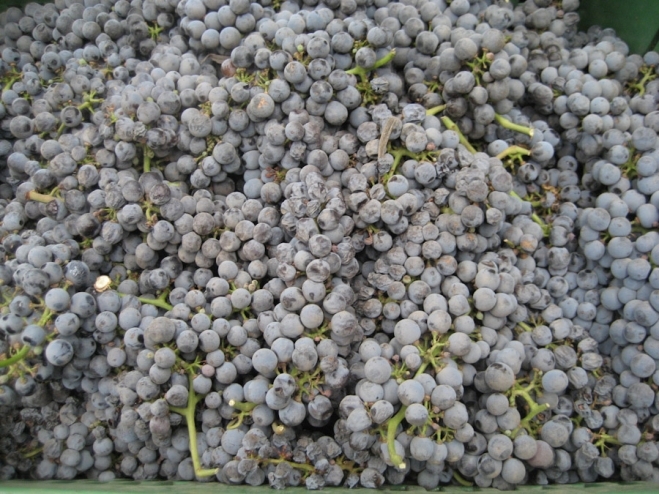 This final ripening on the vine yielding higher sugar levels and changing the grape’s color is of no importance for the Seagate grape seed extract production. The antioxidant level in both the skin and the seeds is at its peak during this period. 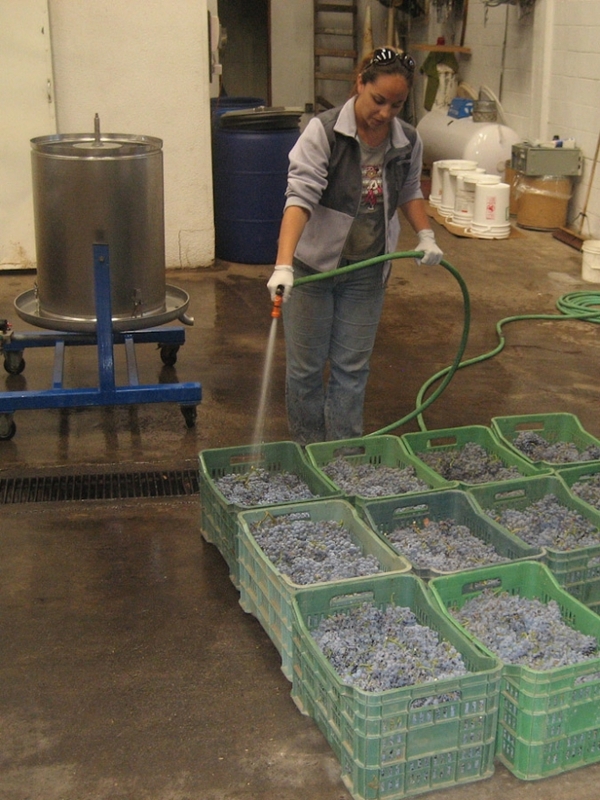 When the grapes arrive at the factory, they receive a final spraying to remove any dirt or insects that might have been transported from the vineyard. Seagate has several different grape presses in the factory. The oldest one in the picture below is being loaded by hand. This press is simply a stainless steel perforated cylinder with an internal rubber bladder located directly below the round disk. Once the top is sealed, a high pressure line attached to the bladder begins to fill the bladder with water. 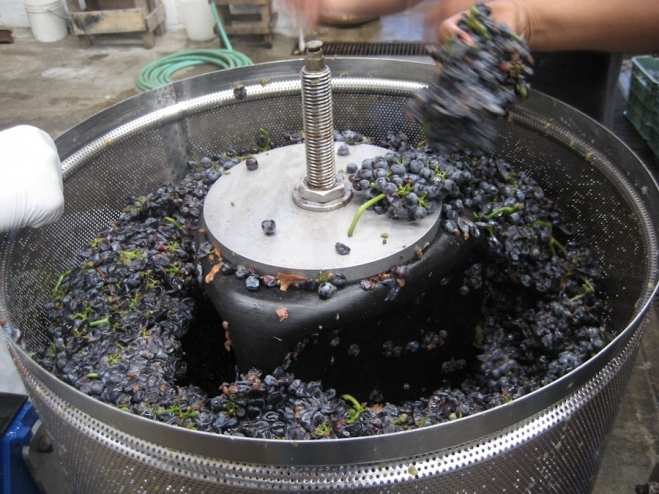 As the bladder expands, it presses the grapes against the stainless steel screen forcing the grapes to release their juice. The juice flows out of the press and is collected in plastic buckets. Depending upon the sugar level, this juice is sometimes fermented in wood barrels into wine for local consumption.Unlike a vineyard which keeps the juice and separates and eventually discards the skin and seeds, Seagate gives away the juice and saves the seeds and skin inside the press which are both utilized in the extract production. The photo of the week is of a French Angelfish drifting across the reef with one eye monitoring the photographer, who was 2 feet away. If you can stay motionless and hold your breath, many interesting things will eventually swim close to you.